Perlis is the smallest state in Malaysia located at the most northern part in Peninsular bordering Thailand. There are not many accommodations in Perlis and you will only find a few mid range hotels and budget guesthouses. Although there are quite a number of tourist destinations in Perlis but most traveler arriving this state for transit or overnight stay before continuing their journey to Thailand via Padang Besar, especially for travelers from Johor and Singapore as the driving journey will takes more than 10 hours. The best place to stay in Perlis is the Kangar town where there are several tourist spots located nearby. The 3 stars Putra Palace Hotel and 2 stars Seri Malaysia Hotel Kangar are both operating here. There are also quite a number of affordable inns and lodges which are perfect for the backpackers. For visitors who are looking for a relaxing holiday can choose to stay in the Tasoh Lake Resort and Retreat overlooking the beautiful panoramic natural views of Timah Tasoh Lake. The resort is located at about 12km away from Kangar town and 15km from Padang Besar. For golf lover, about 10km away from the Kangar town lies the Putra Golf Club. The golf club features an 18 holes course surrounded by a tropical rainforest that makes the course a rustic feel. The course may look like easy to conquer but the water hazards, occasional ravines and bunkering often create some annoyance to the golfer. 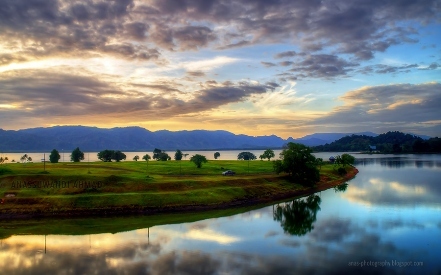 For a golf vacation in Perlis, visitor can choose to opt in to the Putra Palace Hotel located in the town of Kangar or any other hotels available in the town.